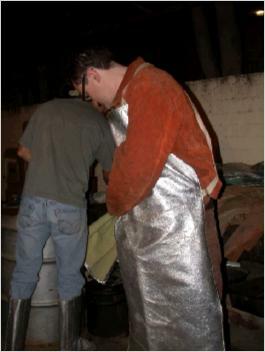 These pages document a bronze pour we did at the foundry class I teach at California State University Long Beach. 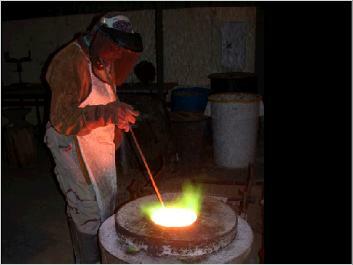 A bronze pour is much like a dance - each person has thier own set of jobs that they execute in harmony. In our foundry a pour requires eight people. 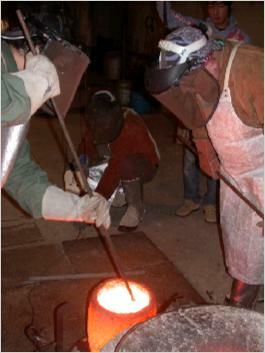 Checking the temperature of the molten bronze. 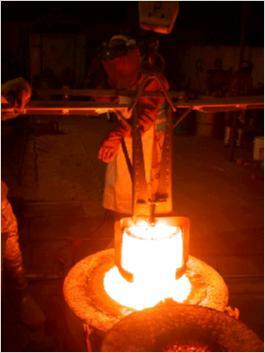 We pour at around 2100°F. The crew is suiting up in protective clothing. The 'lead pour' and 'deadman' (rear) lift the tongs on the crane. The "button man" (right) controls the crane while the 'skimmer' prepares to open the furnace. 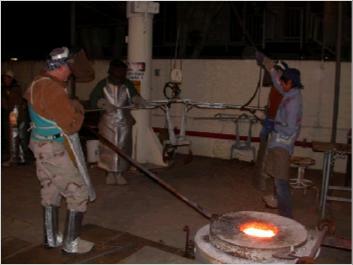 The tongs are lowered into the furnace to lift out the crucible. Pulling the glowing hot crucible out of the furnace. It contains about 200 lb. 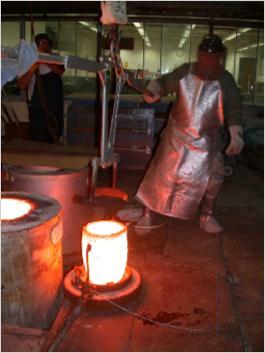 of molten bronze at 2150°F. 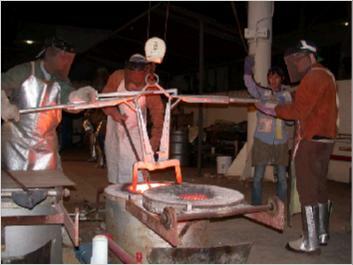 The crucible is placed in the ring shank (aka pouring shank) and the tongs are lifted off and removed from the crane. Skimming the dross (oxides, slag and other crap) which floats on top of the molten bronze. In the rear, the deadman connects the crane hook to the ring shank.